Sola Publishing of Maple Lake, Minnesota, serves the NALC as a ministry partner in the area of education and congregational resources. Emerging as a new Lutheran publishing ministry, Sola Publishing provides teaching resources that are trustworthy and useful, at a reasonable price. Their materials are grounded in the authority of Scripture, with a distinctively confessional Lutheran focus, centering in the gospel message of Jesus Christ. Living out a down-to-earth understanding of discipleship, Sola strives to be practical and functional, with curricula written by people serving in Lutheran congregations of the NALC, along with our partners in LCMC, CALC, and Lutheran CORE. This bi-monthly periodical features mission-centered stories and articles by authors from NALC, CALC, LCMC, Lutheran CORE, and others representing biblical Lutheranism. Written for everyday evangelical Lutheran Christians, the magazine is filled with meaty articles as well as lighter spiritual fare, providing great food for the soul. Each issue features Bible studies, devotional readings, missionary stories, articles on domestic ministries, full-color art and pictures, and regular updates on what is happening in the NALC, LCMC and Lutheran CORE, along with other confessional Lutheran organizations. 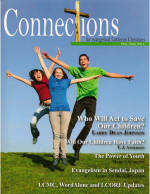 To order an individual subscription, visit the Sola Publishing website. Sola Publishing provides a wealth of free resources for congregations and individuals, including materials for Sunday School, confirmation, adult education, stewardship, the afterlife, liturgies, and worship/lectionary resources. The Sola “News and Feedback” blogsite is for communication and conversation among pastors, teachers, and parents who are using Sola Publishing educational products. You will find information on current curricula and projects under development, news about upcoming releases, and creative ideas for lessons and classroom activities.